Palestinian officials on Wednesday signalled its willingness to delay a United Nations Security Council vote on their bid for statehood by “several months”, as Barack Obama publicly rejected their plans to seek nation status. As President Obama took to the podium of the UN general assembly, officials indicated they were prepared to avert a major diplomatic confrontation and delay their bid, on condition peace talks were resumed in the meantime, raising hopes that a showdown in New York could be avoided. Under a deal still being thrashed out on Wednesday night, Mahmoud Abbas, the president of the Palestinian Authority, would still launch his bid for full UN membership when he addresses world leaders on Friday. He would therefore save face with voters at home, lay down a historical marker and ensure that the bid cannot be quietly forgotten. In return, Mr Abbas would not seek to expedite a debate at the Security Council, where the US has threatened to wield its veto, giving mediators the chance to try to revive Middle East peace talks. The Palestinians decided to pursue their options at the UN after negotiations to establish a state collapsed last year and showed no signs of revival. Nabil Shaath, a senior Palestinian official, denied that a delayed vote was part of the plan. â€œThere will be no intended political manouevre to delay, we donâ€™t want to give the impression we are not serious, because we are serious,â€ he said. However, he added that the Security Council would be given â€œsome timeâ€ to consider the full membership request and placed no deadline for the council to hold a vote. If the application was blocked, he indicated that the option of seeking enhanced observer status at the UN general assembly, where no country holds a veto, would probably be pursued. Mr Sarkozy became the first major leader to publicly back such a plan. Mr Obama conspicuously avoided using the word veto in his speech, which would be an unpopular move given the liberated mood of the Arab spring which his administration has so vocally supported. 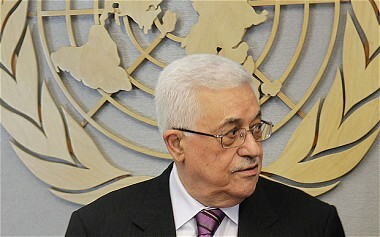 But he made clear that the US could not back the Palestinian proposal. “I am convinced that there is no short cut to the end of a conflict that has endured for decades,” he said. Receiving only lukewarm applause, he pointed out, at the annual UN jamboree 12 months ago Tunisia, Egypt and Libya were all represented by undemocratic leaders now rejected by their peoples. He also praised the world institution for resisting Laurent Gbagbo’s attempts to subvert elections in the Ivory Coast, and for pushing through a referendum that created South Sudan. Grappling with low poll numbers and economic woes at home, Mr Obama was wading into Middle East diplomacy at a critical juncture for his presidency and America’s global credibility. After his speech he embarked on a frantic day’s diplomacy, meeting Israel’s Benjamin Netanyahu, Mr Abbas, David Cameron and Nicolas Sarkozy, president of France. While signs of a breakthrough were encouraging, there was no guarantee that the deal would hold, or that it would prevent violence flaring in Palestinian territories. It also remains unclear whether Israel would be happy with the formula under discussion. Some on the right of the Israeli government have called for sanctions against the Palestinian Authority as soon as they have submitted their application, arguing that even if a debate is significantly delayed a vote would still be inevitable in the future. “Once they’ve submitted their bid, the Palestinians have no incentive to negotiate,” said an Israeli official. Palestinian officials said they were unlikely to raise objections to a compromise offer being advanced by the Middle East Quartet, comprising the US, EU, UN and Russia, that would postpone the debate on the initiative at the UN but grant the Palestinian Authority enhanced observer status. Mr Sarkozy became yesterday publicly backed the idea in his own speech to the general assembly.